With 6 days left before the Feb 7 Trade Deadline, the NBA is digesting the surprise trade of discontent Kristaps Porzingis from New York Knicks to Dallas Mavericks. Another impending trade could be Anthony Davis who is rumored to want to join LeBron James at Los Angeles Lakers. They also share the same agent so it’s suspected that the players engineered the move to force the trade to LA Lakers by publicly stating Davis won’t resign with the Pelicans next year. I feel bad for Knicks fans. Two players this decade appeared to bring them real joy: Jeremy Lin and Porzingis. Management told both to take a hike. It is unknown if any potential Jeremy Lin trade might be linked to any multi-trade scenarios. With these big trades happening, it simply takes a backseat until after NBA Teams finish trying to get Anthony Davis from New Orleans Pelicans. Jeremy Lin also tweeted a response regarding Porzingis trade. The latest trade proposal being proposed is involving Utah Jazz but there are no sources being quoted. OK, I admit it. I straight-up stole this one from friend and co-host Dan Favale’s trade piece for Bleacher Report in early January. I just love it. For Utah, Porter can instantly slot in at the 4 and potentially create a souped-up, longer version of the small-ball lineups with which the Jazz already dominate. Jeremy Lin, while posting a lower overall Box Plus-Minus than Rubio this season, is still an upgrade offensively. He’s averaging 19.8 points, 6.7 assists, 5.3 free throws and 1.6 threes per 36 minutes, with a .597 True Shooting Percentage. And I’d be optimistic about what Quin Snyderand Utah’s system might be able to draw out of him on defense. Let’s enjoy Super Bowl Sunday and Happy Chinese New Year folks! Wish JL a healthy and lucky trade by 02/07/2019! Yes, HAPPY CHINESE NEW YEAR! and for sure. A HEALTHY JLIN, with LUCKY TRADE. Feel bad for Casspi. Injuries have cost him too. He would have been part of the championship last year. But then got hurt and got waived. Jeez. Come to think of it, Landry Fields too. We are very lucky that we still have JLIN. MUST APPRECIATE! For those who have League Pass from the Hawks feed. This segment occurred after Pierce called time-out. During 2Q, with 8:48 left, with the score Kings 41, Hawks 33. Aldridge did voice-over of the bowling vid. IF TRUE, I know ALL OF US HERE WOULD BE MOST HAPPY FOR LIN AND SAY “IT’S ABOUT TIME”! 🙂 But, hey, I’m a cynic. On a 14 day road trip, all that traveling. And having to focus on the games as priority. If you have a girlfriend, and IF you have ANY time off, are you going to spend the time ONLY with her? Or are you going to spend it bowling with her and your buddies? COME ON, REALLY? This also assumes the relationship is so solid that he has introduced her to his probably TEMPORARY teammates and coaches. Andre Aldridge wasn’t personally there. It wouldn’t surprise me if he just misunderstood the story. I don’t buy it. I won’t believe ANYTHING unless there’s video or photo EVIDENCE, with corroboration BY LIN. ANYONE HAVE VIDEO OR PHOTOS? LOL. We had a thread on it long time back…. After learning DRussel made to All Start, I now feel I am watching wrestling not NBA games. So the context was playing a fun bowling game with teammates and supposedly Lin’s GF. id like to take this opportunity to thank dorothy for her “lin in and out” (burger) reports. so i know when to actually watch the game. btw has anyone else noticed that lin is never on the bench at the beginning of the game or the start of the 2nd half. i assume hes off somewhere doing some kind of stretching or exercise. don’t hear any trade news yet. I hope so too. no question about it, Lin will be traded soon and the reason he won’t play 20 minute is because they want to protect him from any injuries. Lin is gone and this is a good thing. this is so frustrating. Why play Lin 3 min and sub Trae back in with 1 min to go? Why not just let Lin finish the quarter??? because they’re about to trade him and the last thing they want is an injury while playing his normal minutes. I believe this is exactly why they don’t want to play him much but some of it has to do with Trae shooting well. he needs to get out of hawks asap. does not matter, how many Harden misses? Hope so. If not, watching Lin for the remainder of the season will be like getting a root canal/game. No Bueno. Yes but I don’t have high hopes. Yuta is getting the same mistreatment. Memphis has all these injuries yet other G league players are getting the run except him. Couldn’t be due to the two-way contract which is why players are discouraged from signing them. Either way guys like Yuta and Lin can bring efficient scoring and excitement to the NBA but they’d rather rig it and keep their own little designated circle. Guys, if we understand what the NBA is made of, we would not be frustrated. Just watch the game as a wrestling game, then everything is fine. why not just sit him until trade deadline to prove that he’s being traded and not because he can’t play. he can miss a thousand. You forget Bremby the wannabe PG. We don’t watch to see Lin make money, we watch to see our favorite player score. Honestly waiting and hoping Lin and Yuta gets their rightful minutes and run is just painful. I wish there was another pro basketball league in Canada so there’d be more options for Asian players like Lin and Yuta who can give NBA a run for their money. So many players are unfairly treated yet NBA gets the most attention and is best league for basketball. At least soccer players have more options in Europe and Germany. i wish jeremy would buy out his contract and say F this. Get out of this team. this is horrible to watch. It’s every team he’s been on minus Knicks. And that’s why NBA’s competitiveness has fallen off the cliff but they don’t care as money continues to roll in. Guys like Russel, Walker, Lillard, Harden, and so many more have no business being franchises. I don’t, Charlotte just used Lin to do all the heavy lifting and defense while Walker chucked shots. JLin isn’t going to throw away all that money, not happening. Few more days and we’ll know if Lin will be traded. Actually I am OK with low minutes here. The lower the better. Save the energy and mileage for next team. With all those billionaires in Asia, why is there not a group that can buy a franchise and stock the team with non-traditional players for greater global appeal ? I guess the barriers to entry is pretty steep. I watch NBA because of Jeremy. If Jeremy out of the League, I’ll quit watching it. Joe Tsai bought 49% and before that they had a 100% Russian owner yet do we see more Russian or foreign players on the Nets? No? There’s your answer. NBA will not let any foreign owners do as they please. There will be other Asian players after JLin, it’s exactly why Joe Tsai did what he did. He thinks Lin’s replaceable. Watching the game in the morning in Taipei, visiting family here. I shared the frustration of posters of Lin’s random PT with Hawks. He deserves much better, but this is the only BB league in the US. Sigh. The game stream (Jazz Int. feed) stops every 2 minutes. LOL. exactly, especially under current China-US atmosphere. Traitor Joe will be surprised. Lin is one of the rare one has this stubbornness and toughness I ever seen. Whole team is sucking to start 3Q. Outscored 14-5 and Trae not doing much. Com’on LP, put Lin in !!! Did I just hear the floor reporter say that Lin’s teammates think its”funny” that Lin gets smacked in the face/head by the other team? What the F…! Instead of getting upset about the unusually high instances of “face hits” to their teammate, they think its funny? Geez.. with teammates like these, you really don’t need any enemies. anybody can shoot except lin. Maybe they’re mocking the refs. Lin himself made a joke about it on IG about how he gets the most face hits in the league…When complaints falls to deaf ears the only thing you can do is turn it into a joke. nobody respects lin. atleast he’s a ahead of anderson the the other bench warmer. he should start shooting when he gets in. Zero plays, Lin dribbles gets doubled and stuck, passes the ball. Making him look real bad while making Trae look good. Doesn’t work that way, as we’ve seen, Lin only got the green light for 1 showcase game vs Raptors. When that happened Lin got to shoot whenever he wanted and played well. If not it’s just the passing PG role. same here. Life of a Lin fan. watching for Dorothy lin in lol. Watching Jazz beat the Hawks and embarrassing them is definitely worth it. Makes Lin sitting out much better. Ricky Rubio did a crazy 360 layup against Trae, so nice. LMAO Trae got the Lin treatment driving to the rim. Got undercut when driving. So glad Lin’s on the bench can’t have any injuries or falls like that. I wonder if Lin trade might be in the works already. lol Trae got 4 fouls and the crowd cheered! haha Loving this! Makes Lin’s unfair benching worth it! Hawks looking like idiots passing on Luka Doncic. No clue but Trae’s been playing well and started the game going 4-5 but he went cold and Jazz started playing and defending more aggressive. Ricky Rubio and Rudy Gobert are legit star players. Gordon Hayward must regret leaving them for Celtics. Honestly they are 1 star away from being serious contenders. Wish Lin had such smart and unselfish teammates. no, Celtics have a smart coach. Hasn’t happened for past 2-3 games already so I’m not surprised. Lin trade in the works and Trae looked like he was shooting and playing well recently. Lin in to keep Trae from closing such an embarrassing loss, LP is ridiculous. If the few minutes keeps up but Lin is not traded, it’s better to ask for a buyout for sure. Never seen so many hugs after every blowout loss. It’s like Hawks are doing friendly basketball matches worst than G league basketball. Lin himself can’t be happy with a measly 11 minutes. If it continues but he’s not traded, his camp should ask for a buyout. For now, let’s hope there’s already a trade in the works. Jazz has 2 unselfish stars. Without Kyrie Irving and Hayward coming back from injury Celtics aren’t going anywhere. Well Lin did post that twitter hint so…lets up something is up. Glad I stayed for the last quarter, so much fun watching the Hawks like Trae, Huerter, Collins getting whooped and embarrassed. There was zero need for Lin to come back in at all for only 1min. LP just wanted Lin to take the fall for the loss and save Trae from the end of game embarrassment. yup…Hawks will not get a first rounder for Lin but even if they fail to trade him, Lin needs to demand a buy-out. I do believe the reason he didn’t play much is probably to keep him from getting hurt. Utah Jazz was 1 of my favorite destination for Lin but Rubio played above his regular performance while Lin didn’t have the minutes to impress. Based on tonight game, Jazz probably keep Rubio and doesn’t trade for Lin. They can still use Lin as a starting SG and stagger his minutes with Rubio. Lin, Rubio, and Gobert would make a compatible unselfish team. Yeah, it could work but Lin’s 3 point shooting has crashed, so they probably wouldn’t do that unless Lin was still shooting 40% from 3’s. I suspect Lin interest around the league went down once his 3point % starting going down. With a good 3point percentage, team could had easily brought him in as a SG next to another PG. Also, u forget Donovan Mitchell who plays SG, so Lin/Rubio wouldn’t work since Donovan plays SG. Someone stated maybe Lin could start tomorrow. Could be a possibility since Trae got hurt a bit driving for a lay-up…perfect time to rest Trae on a back-to-back game. Highly likely, would like to keep seeing the Lin-Led linkage elsewhere. I created the #buyoutifnottraded poll for Lin fans. I’m very concerned that the Hawks would depress Lin’s minutes to 10-15mpg for the rest of the season. Hopefully, JLin and his agent can see it and know his fans care about his future. No need, the way he described it. Lin sounds similar to John Stockton where people couldn’t get under his skin. Then Gary just stopped and just went at Stockton and it just became competitive. That fast? Sounds more like a last ditch showcase before the deadline. I’ll take it if Lin starts and Trae’s out. Once Lin’s gone Trae will get injured, with his height and lack of respect, guys will undercut him at the rim and hard foul him. Your 2nd option is bias. “be content”. Just cause Lin stays as a backup doesn’t mean he’s content. Maybe he doesn’t want to give up all that money. Perhaps it wasn’t too clear, but I hope I provide the context of 10-15 backup PG that is not acceptable. Many Lin fans are ok with 20-25mpg backup PG carving a big role in a team but after 11 min tonight, I’m concerned his minutes will diminish even further. I believe Lin still wants to be a starter, All-Star, championship as his NBA goals. If he and he doesn’t push back the low minutes/minimal backup PG role, there is a risk what happened after the Lakers season will happen again. There’s barely any good offer so he had to settle for the Hornets role. And this time, he’s 30 (no longer 27) so he’ll have to accept the backup PG label. If Lin changes his goal to no longer be a starter, I will certainly support him. But if he hasn’t yet, I believe he and his agent to do something. Either negotiate a buyout if not traded or ask for more minutes if he stays, similar to how his old agent, Roger Montgomery, pushed back on the Lakers after Byron Scott gave him a DNP. I don’t twitter but if I did I would vote buy out. Risk-reward he has to leave some money in order to break with the identity of being bench warmer on a tanking team. I can’t believe somebody doesn’t want to trade for JLin but he does come with salary baggage which means a basic trade of equal value. ATL has made no signal as to who would replace JLin if he were to leave so it is making me slightly suspicious that ATL May be content on keeping him for the season. I sure hope not. Didn’t give JLin any time in Utah so it looks like Utah is off the list of suitors. That still leaves only TOR who has gotten the full showcase with JLin unleashed. Wonder what TOR could offer? Lin’s advantage is at the 1 guard so unless the team trading for him wanted to start him as PG or backup PG, giving up assets would be a waste. There’s no need to trade for Lin if they were looking for a SG. I also suspect Lin’s poor and low 3 point attempts made teams think twice about trading for him. Like I said, 3 point shooting is much needed in modern basketball. If Lin doesn’t add more off dribble and moves to expand his 3 point shooting there’s no way any team will ever start him, let alone see him as a star. Looks like I didn’t miss much. I see a lot of frustration on here, and out on Twitter. Wow, everybody is unhappy with Lin’s playing time tonight. Well, that s***ks. I wonder if I’m not as frustrated because I don’t always get to watch the entire game live. So, I kind of know what to expect when I watch, it’s less of a shock. Will watch later, maybe just fast forward to Lin’s minutes. LOL. Hope springs eternal. First game of a road B2B. Young played 37 minutes. Maybe Lin will get more time tomorrow. I mean, Len has had great games recently. Yet, Len still only got 9 mins, even less than Lin. VC got very little time last few games, but played 13 tonight. note: as pointed out previously going into this game lin and len were 1 and 2 in scoring in the nba in points per game among currently active players averaging 20 min. per game or less. The 9min + 2min garbage time is really concerning for me. I’m not happy but okay with good stats in 20+mpg so far even stays in Atlanta. But if Lin starts getting 10-15mpg the rest of the season, my #1 concern is there won’t be any good offer for Lin in the offseason. All NBA teams will low-ball Lin on the offer because he’s been used as ’10-15 min/game’ backup PG. That’s why I would recommend Lin’s agent to push back a bit so Atlanta would do the right thing for JLin (e.g. trade, more minutes, buyout, etc.) They might think he’s too nice so he won’t complain being given 10-15mpg. From what I heard, perhaps not much offer from TOR but maybe I’m wrong. The key is for ATL to know if they want to get 1st or 2nd round pick for Lin or they value Lin’s mentoring to Trae the rest of the season. If they know Lin is not happy with 10-15mpg, they might be more inclined to trade him, give him more minutes, or give buyout if a playoff team can use his service and GM is being nice to Lin to appreciate him. Hopefully Lin’s camp will talk to ATL Front Office about the low minutes similar to the Byron Scott’s DNP situation in the Lakers. Buying out will be hard since Hawks may ask him to give up all the money that he hasn’t received. My hope is he already got more than half of the yearly $13M..I don’t know how NBA player gets paid but I suspect they gets paid by incremental or monthly so may Lin is only owe maybe 4-5 mil…If so, it could be worth it to sacrifice the remaining 4-5 Mill and hope he can get it back this summer during free agency. I remember that poll. Nice try Psalm, as match-maker. LOL. Arden Cho is still keeping in touch. She was just at the Clippers games with Lin’s friends! Also see some familiar names. IsabeliJane…Sophie Paris…. Yup..There’s hint out there that Lin is not happy with his minutes so I hope Lin already spoke with them in a respectful manner just so they know Lin’s preference is to be traded or buy-out. Buy-out is preferable, even for the Hawks if they can’t trade Lin while getting back a first rounder without taking a bad contract. I suspect the only way Hawks can get a first-round for Lin is if they take a bad contract alongside it. Houston is offering their first rounder but you have to take Brandon Knight terrible contract. You really think it would make a difference? It’s been a good couple of days for the Atlanta Hawks and Travis Schlenk. His draft picks Collins and Young are both in the Rising Stars game. Young also in skills challenge. Collins could be in dunk contest. Young’s stats have been improving by a lot. Just won East Rookie of the Month AGAIN. My point is, like Dorothy said. This is the NBA. They PRE-DETERMINE who the stars will be. And who will be given all the support and opportunities to reach that. Look at D’Angelo Russell. Even when the Lakers traded him away, look how much Brooklyn has helped him. Look at John Wall vs Jeremy Lin. We could go on and on. And we have. LOL. Perfectly right…His rep was destroyed after his stint with the Lakers…That is because he was benched while playing for the worst team in the NBA. If he stays with the Hawks, I also fear is rep will be terrible entering free agency. On the other hand, if he were to go to a playoff team and contributed, even as a bench player, his status would be high for free agency. Look at Terry Rozier..He had a great playoff after Kyrie Irving got hurt and while he’s having a terrible year while coming off the bench, many around the league still regard him as a starting PG and he will get offer this summer as a restricted free agent. So what I’m saying is Lin staying in ATL as a bench player on a top 5 worst team, will destroy his rep..
Lin needs to get out. I really hope Lin and his agent talk to Atlanta Front Office about their preference; I know they’re not happy with the low minutes like his brother and his friends. Don’t forget the ULTIMATE blatant sham of the NBA. This thing called “REVENUE SHARING”. They pretend there is competition between all these teams. Trading with each other’s players. They’re just moving the pieces around. The excuse is parity between big market and small market teams. That’s why all these awards of All-Stars, First Teams, Second Teams, MVPs, etc. go to certain players, all pre-determined. Are badly managed teams, giving away fat contracts to “superstars”, really being penalized? Nope. One team’s gain is really everybody’s gain. They’re all in it together. Okay, conspiracy theory much. And I’m over-simplifying. But I bet I’m not too far off…. Manufactured stars are common in the NBA; GM makes draft picks and will do everything possible so their picks will look good. It means job security for them. That’s why Linsanity in 2012 was such a miracle that it can happen at the right time, the right place, the right coach. An undrafted and an outsider like Lin can break the Most Points in 4-5 by any starters including all Hall-Of-Famers! It’s simply outstanding and not supposed to happen. NBA loves their scorers so we can only hope JLin can stay healthy and find his ways to not only survive but thrive in the NBA. He just needs one good break like when the Knicks starters can’t play much in 2012. This is funny. Draymond Green trolled Rudy Gobert for being upset about not getting into All Star game. Draymond didn’t get in either. DG probably more sympathetic than how it looks. Remember, as @sport said, only scorers get the glory, not defensive players. DG knows. First night of B2B on the road. Could be because of that. Or not. Not making excuses for the Hawks. Let’s revisit after tomorrow? It’s the first game like that in awhile. So I’m going to give it 2 more games, until trade deadline. Other than that. TOTALLY AGREE. Still would like to see if Lin can get a starting role with a team. At the very least, good minutes as 6th man, who makes an impact on games. I could be delusional. But I still REFUSE to believe that Lin worked so hard on his rehab to recover and get back, only to be a 10-15 mpg back up. Like you, I don’t think Lin can be happy with that. He loves to, and wants to, play. So, I’m hoping that Lin and his agent are working on something. Houston does have their first round pick on the table for whoever is willing to take Brandon Knight. Yes, the Knicks fans did, anyway. For the most part. JUST ONE MORE CHANCE!!!! That’s all we need! Needs a FO, and an owner, that has the guts to let the Asian-American baller lead a team. Personally, I think it has very little to do with Lin’s skills. NBA is all about money, bias, entertainment not true sport. NBA will eventually collapse and there will be a true international bb league. Deep i my heart…i would like to see Lin-Harden combo with the right coach! They could easily take on any NBA team! as everyone from coaches to players to fans are pointing out: the nba is becoming a joke “sports entertainment” on a par with the wwe. ➡️ If this had been a close game when JLin entered the game, would he have been given the freedom the freedom to look for his own shot so aggressively, or just be instructed to not shoot and distribute to others if? 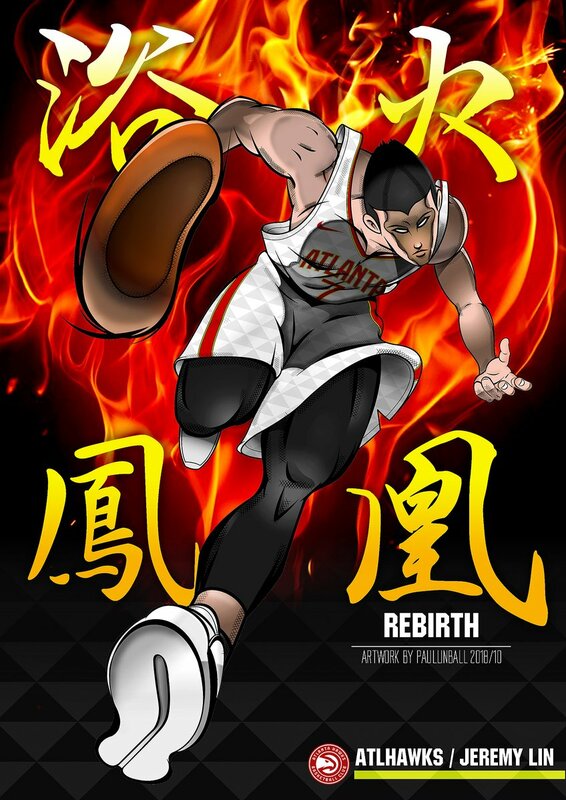 my feeling is that the hawks wont trade lin at all this season – he will be there as trae’s mentor ( lol ) and esp since he isnt playing like himself maybe his value isnt that high. there were rumors but it seems to have gone quiet but who knows – and i dont think lin is the guy who will ask for a buyout either. IMO, if there is a trade prospect, Hawks FO will consider it, even with 2nd round pick. It is all about business. As for mentoring their so called franchise player, give me a break. It is all about PR, for the team and for the recipient (assuming he is receiving), not so much for Lin (maybe a bit to promote Lin’s integrity and off court impact to the market). I don’t buy the mentoring stuff. Hawks will keep Lin for the rest of the season just for mentoring Trae? Well, what’s left to mentor? Trae is thrown into starting post since first game and he will learn it the brutal way. i don’t see how Lin can mentor Trae from bench, not playing starting role (even at side as SG) to let Trae learn at game situation real time. This is mentoring by example. But no, no, Hawks won’t want to take the chance to have Lin/Trae comparison. Just see Lin’s minutes. In November when Lin started to heat up and there was a voice advocating Lin starting, then Lin’s minutes reduced to yanked here and yanked there. I totally agree with you. I went back to see what Trae father said anout Lin’s mentoring, he only mentioned Lin’s off court. Not surprised, who would not admit his son learns any BB skills from a NBA ordained back up PG. Have we ever seen one single NBA team signed a player to be off court model for their players? Whoever believes it got to be kidding. Someday I would like to know the real story of what happened to Jlin from November during during which time he was electrifying the league as a sub to now, where from December his playing skills have been greatly nullified. From November when even the announcers dared mention that he should start to now, where he has no performance track record to gauge his abilities. There is something that smells bad here and since Ledumb is not here it is not him. Has the NBA fallen so far in sports values that not only would they let their teams tank but they would allow a team to “target tank” an individual player so that he does not over shadow their anointed “star”. The comments on this board are gloomy but I am hopeful of a pleasant surprise for us fans and Jlin as we approach the trade deadline. he probably saving the real stuff for the team he will get traded to. he is thinking f-k this sht.. if i’m not going to playoffs with this team and getting traded anyways, why tf do I have to play lights out? so they can trade me and get something even higher? what if I get traded to say cavs after playing lights out? Should I contintue to play lights out for the cavs team and jeopardize my healthy and no point. He is thinking.. if you trade me to a contender, then for that contender, I will play lights out for them to get and win playoffs. If you trade me to a tanker, if I play lights out now, I will not want and will not allow to play lights out for a tanker anyways so it will seem like I have not improved after getting traded. Plus only those players in the playoff teams get notices anyways. So no pointt. I see what you doing there jlin. I would prefer Lin to be traded to a team still in contention for the playoff but wouldn’t mind Lin traded to Phoenix instead of staying in ATL with less than 20 minutes.